Oxygen refilling systems, or oxygen transfilling systems as sometimes referred to, are designed for filling one to three C, D or E cylinders at a time from a supply bank of three to ten large oxygen storage cylinders. 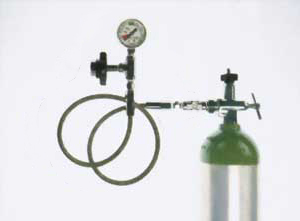 This oxygen fill system is designed to benefit those who need to fill a smaller number of cylinders such as start up home health care companies, ambulance companies, EMS crews and fire departments. Oxygen refilling assembly system provides a convenient way of refilling oxygen cylinders from one single large oxygen storage cylinder at a time. The assembly can be moved from supply cylinder to supply cylinder to obtain higher pressures in your small oxygen cylinder. 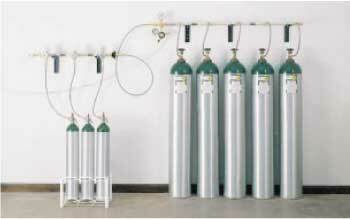 For oxygen carts and oxygen cylinder storage racks click here. Copyright 2016 American Airworks. All rights reserved.